All nations change, there is no way avoiding it. Sometimes we all wish that the setting is set in stone. Some would want to be philosophers in ancient Greece, some prefer the scandalous lives of ancient Rome, some see the comfort being a non-poor person in Victorian England and others seek the renaissance of Roma, Venice and Florence. We all have wants, needs and desires. We all wish it was another time. Yet some seek denial, some seek a change that requires events of the past to be deniable. If they succeed they can push for larger changes that are optionally profitable form them. That is how I see the news (at https://www.theguardian.com/world/2019/apr/12/academics-launch-petition-against-racist-mural-in-french-parliament), where we are treated to ‘Academics launch petition against ‘racist’ mural in French parliament‘. 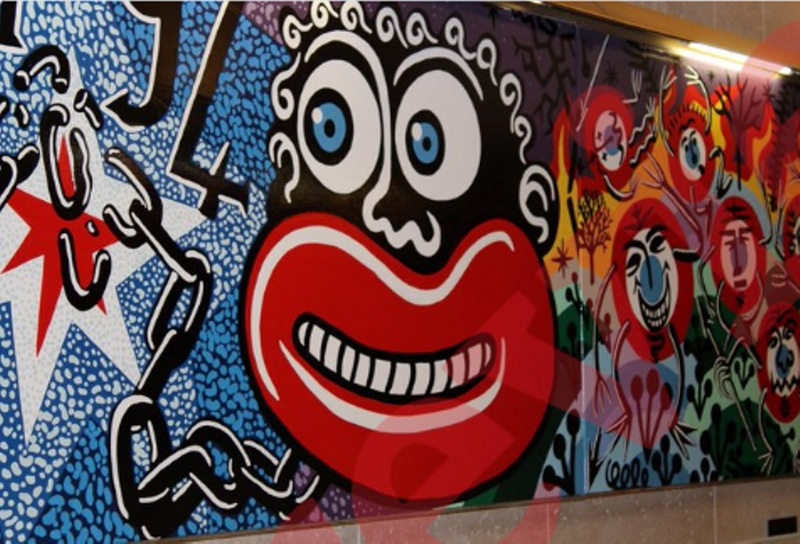 The news gives us: “Two French academics have launched a petition to remove a parliament mural commemorating the abolition of slavery, which they said was a racist, humiliating and dehumanising depiction of black people“, I am not sure if these two appreciate the impact and history of art. One is a French writer (Julien Suaudeau), the other a film director (Mame-Fatou Niang), so when it comes to art, their view of art is likely to be better than mine, let’s put that up front. When I see the art, I see no negativity, I see the happiness and joy of the end of slavery, chains broken, so when I see “Its presence – in complete indifference – at the heart of one the highest sites of the Republic adds insult to injury”, I honestly don’t get it. The work is 28 years old, if it was truly racist, papers all over the world would have written about it for the longest of times. I personally believe that those who want to make a new move to the new iconographic of denial through art believe that this work of art is in the way. Perhaps it is just my shallow look, I will not deny that it might be me and that I am totally wrong, but I feel that after 28 years with non reported complaints I actually might have a case here. And when we see “It features “two huge black faces, with bulging eyes, oversized bright red lips, carnivorous teeth, in an imagery borrowing to [sic] Sambo, the Banania commercials and Tintin in the Congo” we might initially think that there is a case, yet the painting is about iconography and when we consider Tin Tin, from the world famous Belgium artist Hergé, we need to take a step back and it is then that we should realise (those who have seen the murals), that the mural ‘1948 Le suffrage universel‘ shows similar iconography and that is not about black people. The fact that the New Yorker went with ““I was just shocked,” Niang recalled. “I’m a French black person. The piece tells me that this is how my country sees me”” making the issue (from my personal point if view) a strange turn. They also give us: “Di Rosa says that his style is influenced by pop culture: comic books, science fiction, and punk. He often paints white people with similarly exaggerated features and considers “big red lips” a signature of his mythological world.” OK, that makes sense, and it is in the end not a photograph, it is art. Yet, when we learn more on the two individuals (or better stated as the New Yorker hands it to us, we see: “Niang and Suaudeau’s ultimate goal, they say, “is to raise French people’s awareness of the colonial wound.” Both of them live in the United States. She is an associate professor of French studies at Carnegie Mellon; he is an instructor in the French and Francophone studies program at Bryn Mawr. Their insistence that a black woman’s experience of a work of art is as important as a white man’s aims in making it—their insistence on acknowledging context, subjectivity, and identity—has been taken by some French commentators as an attempt to inflict American notions of political correctness upon French culture.” I am faced with two parts. The first is ‘awareness of the colonial wound‘, which is fair enough. Yet that requires new art, new (read: different) views and view that creates a ripe stage of creating awareness, this assault on one of nine murals will not achieve that, it merely shows some level of subterfuge to remove 9 murals for whatever reason and not willing to come out loud stating that they want these walls for their needs or the needs of their friends. This is merely my personal view on the matter, the fact that they have gotten 2,500 votes so far seems to support my view, set that number against 70,000,000 voices on some view regarding Jamal Khashoggi whilst none of them had any view on actual evidence supports the numbers game. The second one is ‘inflict American notions of political correctness‘ is a much larger issue. It almost sets the stage where Walt Disney put Donald Trump in the White House telling the world that Technicolor productions are a thing of the past, how is that for analogy? I believe that there is a shift and in that shift the directness of some works of art are too much of a reminder that some shifts are actually a bad thing. The New Yorker also gives us: “On social media, the two have been inundated with vitriolic comments (more often targeting her than him, as is the custom). In the French press, they’ve been depicted as, at best, “fervent promoters of the black identity,” and, at worst, “fanatics in need of publicity.”” I refuse to target them, it is not my thing, as for ‘fanatics in need of publicity‘, I would need to know both a lot more than I currently do, yet one of my first thoughts was that: “They are probably in need of attention“, which is not a given, and ranks on the same page as people thinking ‘that person probably asked for a raise‘ when a cast member of a TV series is written out of the show. And then we get the gem that matters, the part the New Yorker is getting right. With: ‘the history of slavery and racism in America is not the same as that of slavery and racism in France‘. It is an important distinction as it is a much larger issue. The Dutch had the colonies in Indonesia, that is, until 17 August 1945 when Sukarno read a statement on the radio and became the first president of Indonesia. Belgium had issues with the Congo and the list of events goes on. What some see in one light, other see different? Yes the US has slavery for the longest times, and the Dutch were not innocent as they traded New York for Suriname merely for the profit of slaves. The Dutch abolished slavery in 1863, 2 years before the US, 69 years after the French, and 30 years after the British, in that light the French were the most enlightened of the 4, a small fact we do not get to see here either. Making denial an option is the most dangerous of all settings, even if this might not have been the case here, the event make me consider the dangers of creating denial. We see it around us all the time, the filtering through the media and the adjustment of perception, the outside intervention of awareness and social adjustments, the second part that we saw with ‘inflict American notions of political correctness‘ is the first indication of social adjustment, social adjustment “is an effort made by an individual to cope with standards, values and needs of a society in order to be accepted. It can be defined as a psychological process“, yet that’s not all and there lies the danger. You see from my personal point of view we should also consider “social adjustment is an attempt to shift standards to introduce adjusted standards, values and needs to make a new society acceptable, which facilitates for the needed psychological process“. It makes me wonder whether this was really about the mural or about the need to see other standards in a stage where the world economy is in a stage to push for changes on behalf of the largest corporations to make legalised slave labour a future option, in that stage the mural of Hervé Di Rosa becomes the largest eye sore in sight for those needing certain essential changes.